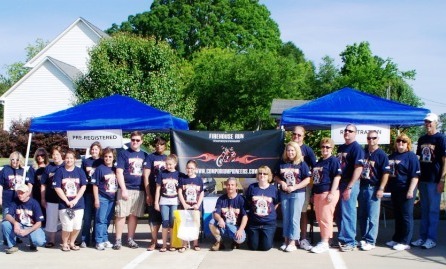 On Saturday May 7th, I rode my Moto Guzzi California Vintage in the 4th annual “Firehouse Run” in York County, South Carolina. The benefit ride is organized by the Comporium Pioneers. 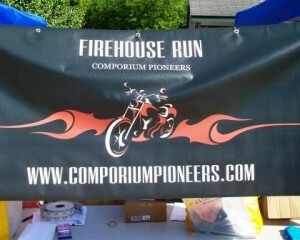 This year’s Firehouse Run was very special. “Never Forget” was the theme on the awesome t-shirts for the event (instantly my new favorite shirt) featuring a fire helmet with number 343 on the badge. All I knew beforehand was that the ride would be about an hour along various county roads. Just before we started out, we heard that we will make two important stops. Our ride leader Leon, who always does a great with these events, informed us our first stop will be to visit a beam from the World Trade Center that was recently obtained by a local fire department as a memorial. Wow. I was not expecting that and was really wanting to see it. 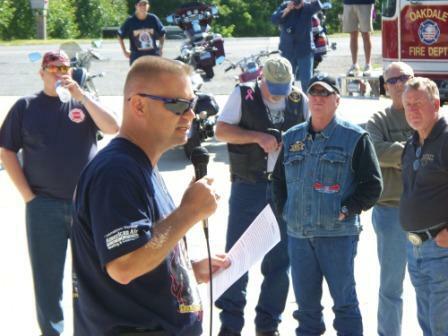 The second stop would be at a new veteran’s memorial that the Comporium Pioneers put together with money raised at events like these. Some of the money came from the Disabled American Veterans ride I participated in a few years ago, so I was looking forward to see this too. As an aside to this story, on around September 8, 2001 I was leaving on a business trip to France. While flying north along east coast that afternoon, the pilot came on to mention that there was a beautiful view of NYC out the left side of the plane. I was on the right side, but somehow got an amazingly clear view across the aisles, with perfect timing and just for a very brief moment, to see the lowering sun shining in gold against the Twin Towers and the NY skyline. I grew up in New York state and have always been fond of the city. I’ll never forget that. Now, back to the Firehouse ride. 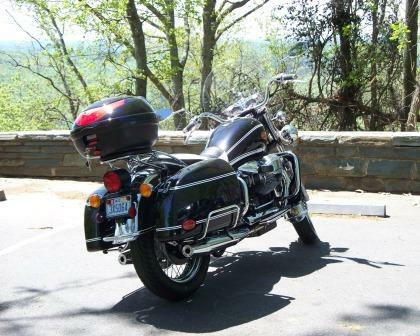 I walked outside into heavy fog as I got my Moto Guzzi and myself ready to go. My neighbor was on his new Star 950 Touring ready to go, so off we rode. 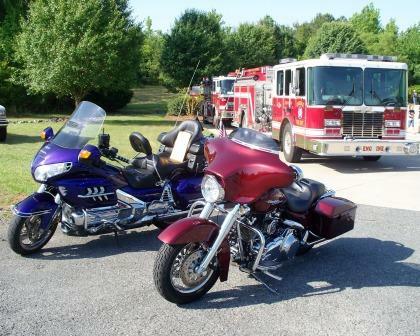 By the time we got to the Oakdale Fire Station #2 in Rock Hill, the fog was gone and the sun was shining bright. We arrived early enough to check out other bikes, get signed in and put on our cool new t-shirts. 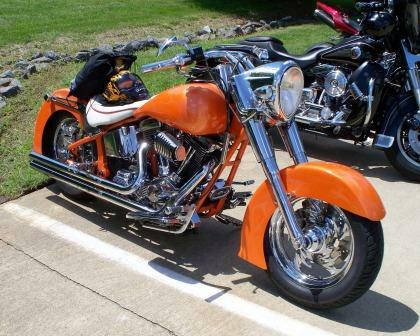 A bright orange and chrome custom v-twin came rolling in as we walked about. I like orange and this one really caught my eye. It was nice to talk with a few folks I had met on previous charity rides I had done in Rock Hill a couple years ago. The last one I did with several of the same riders was a Juvenile Diabetes ride. The fire trucks were cleared out of the station garage, and the garage was set up with tables and chairs. Several donated door prizes were set on tables and I knew if it was like their rides in the past, there would be some good ones. Each rider got a ticket for the drawing, and you could buy extra by the arm’s length, leg length, or by the size of my friend Jimmy’s belly (as he informed me). I have to hand it to Jimmy, he’s a great sport and I believe he helped increase their ticket sales. Now it was last call for the restroom before the kickstands go up. We got the signal to get started. One of the big firetrucks took the lead with lights and sirens clearing our path down the road. 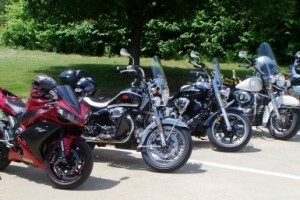 I was not too far from the front and bikes were staggered in line behind as far as I could see in my mirrors. Fun! Luckily, I wasn’t near anyone with overly loud pipes. I could still hear my own bike and I like to shift the Guzzi by ear even though I also glance at the tachometer. We made it to the firefighting training facility where we could see smoke rising as we approached. A pick-up truck was in flames and a group of firemen were participating in their training. We circled around in the driveway lining up to park. And there it was. A beam from the World Trade Center. Some concrete and twisted re-bar is still attached to it. A flimsy sign indicated what it was. Just sitting there on a few boards on the lawn under a couple trees. This memorial badly needs a proper display and I truly hope that this ride will help towards making that happen soon. A group of the firemen that were involved in bringing it here were standing by as we very quietly gathered around it. The beam is real. That may sound odd for me to mention, but the harsh reality of it sincerely struck me the moment I got off my bike and walked towards it. I will visit this again. This beam is stunning, historic, sad, terrible, sacred, and so many other things, all at the same time, that I find it hard to describe. Leon, who is the Assistant Fire Chief at Oakdale and the leader of our ride, hopped up on it and started reading a moving speech he prepared. It surprised me the way he just walked right onto the beam without hesitation. Brave, in the way I imagine so many emergency workers did that day. I don’t think I personally could have approached it like that. I’m glad he did though. We recounted what had happened that terrible day, how many it affected, how the beam was brought to the site we were standing at, and how important it is to us all to remember. 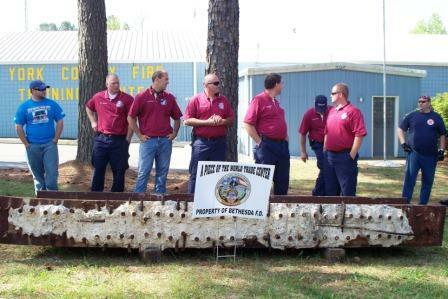 Leon then presented a check to Bob from the Bethesda Fire Department to go towards the costs of obtaining this beam. Bob is one of members of the department that went up to New York to pick it up. A flat bed truck, provided by a local business, was used to help defray costs also. I would have loved to been able to be part of that trip. 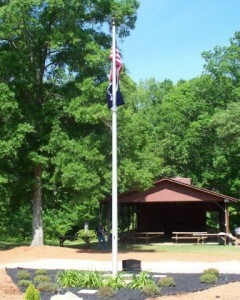 Next we headed over to a park to see the new veteran’s memorial. We rode a very bumpy road, to a long gravel driveway, over a little section of dirt, and into a big mowed field of grass at the park. It’s hard to complain about riding a street bike on that terrain when you’re visiting a memorial for those that sacrificed everything to protect our freedom. The Moto Guzzi California Vintage that I ride has adjustable compression and rebound knobs located within easy reach on the top of the forks. I use it as conditions demand, like these did. I normally just adjust the compression knob a click or two. I suppose the steering stabilizer helps a little too, but I never really adjust it (you can’t while you are riding). These features make the Guzzi California ride better and safer in my opinion since you can adjust to the road conditions to keep the bike’s handling consistent and predictable. That and the standard linked brakes on the Guzzi are two features I really like. Once again, I’m not sure why I’m always the only one riding a Moto Guzzi on these benefit rides, but that’s the way it is. The v-shaped memorial (v for veteran) was freshly landscaped by volunteers and was built with contributions from events like the one we were riding in. 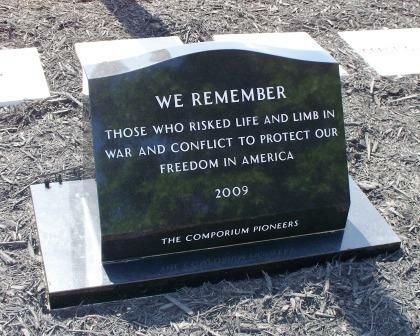 There are engraved paver stones filling in around the memorial. Anyone can have one engraved and placed there with a donation of $50. A great way to remember and a peaceful setting for it too. After Leon explained to us about the memorial, a gentleman in the distance played Taps for us. It was played beautifully and was also striking in all it stood for. Now, it was on with the ride, mainly on rural roads with very little traffic. Having an emergency vehicle leading the way was helpful to us all as drivers take notice. We saw horses, farms, winding roads and plenty of miles, about 75 or so I think. The weather was perfect and the pace was a bit quick as we were on a tight schedule to get back to the fire station for lunch. Riding in a large group like that, I try to really watch my position and the others around me. I adjust my mirrors differently for this type of ride. The factory mirrors on the Guzzi California are good. My only problem is with keeping them shiny since they easily tarnish on the mirror shell, but the stems do not. Upon arriving back at the fire station, lunch was set up for us buffet style with plenty of volunteers helping serve hamburgers, hot dogs, and all the fixings for both, potato chips, and loads of home made cookies and brownies. Bottled water, soda, iced tea, plenty of ice and cups, and I’m sure there were more deserts I forgot to list. A big thanks to all those volunteers that made all that happen. During lunch, they started to call ticket numbers for door prizes. I could not believe how many door prizes they had. Most were donated by local businesses and restaurants. It was amazing how many gift certificates, hats, shirts, and other prizes were given out. I didn’t win anything, but I enjoyed all the fun of the drawing and seeing what other folks had won. As lunch and the prize drawings were just about over, it was announced that a medical helicopter, delayed due to an emergency, is about to make a landing next to the station as a surprise for our ride. It was a very cool way to end the event. Unfortunately, my neighbor and I had run out of time so we didn’t get a chance to check it out, but I enjoyed seeing the blades winding down as I was riding by. Many thanks to all the Comporium Pioneers volunteers, Leon and all the firemen at Oakdale station, the Bethesda crew, and the emergency medical helicopter crew. I’m looking forward to ride my Moto Guzzi California in the next Firehouse Run. The big day had arrived! It was not Christmas day, but it was time for her big ride. I put my black winter jacket on her to go with the black Harley-Davidson helmet (and her black cane). As a little coincidence, my motorcycle is an Italian-made Moto Guzzi California Vintage, and my mother-in-law is Italian-American. 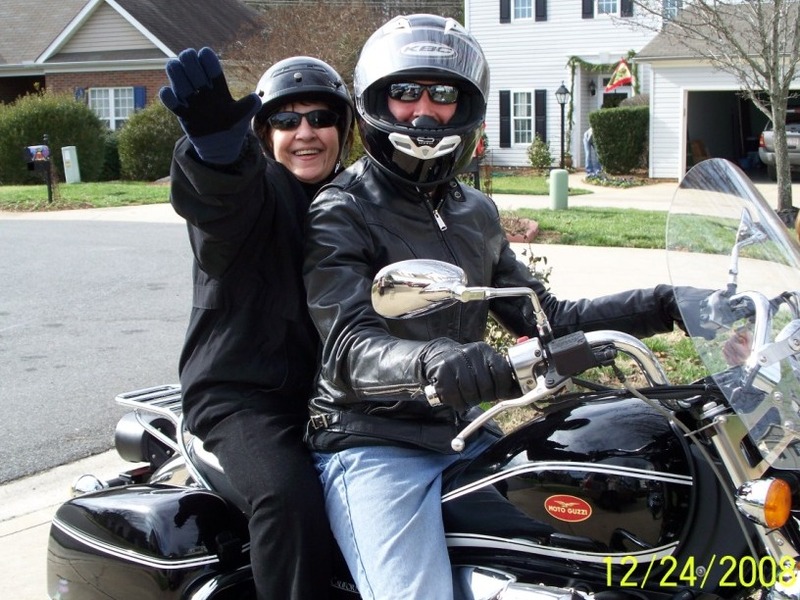 I believe it was the perfect motorcycle for her maiden motorcycle ride.